A family favourite with a smoky Texan style flavour. Combine 1 sachet Grill Mates Smoky Texan style marinade with the oil and water in a bowl. Brush peppers and onion with the marinade then place the chicken into the bowl with the remaining marinade, cover and allow to marinate for ½ hour. Cook the chicken on the barbecue for 10-15 minutes, adding the vegetables for the last 5 minutes. Ensure the chicken is cooked through before serving, then slice into strips. Serve in fajitas with sour cream and salsa. 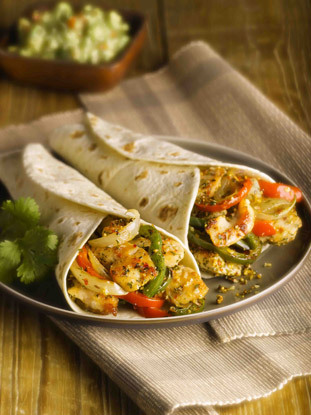 Chunky and filling fajitas, packed with delicious vegetables and Quorn chicken style pieces. Introduce your mum to something a little more adventurous this Mother’s Day with a delicious meal from Discovery. A perfect, easy recipe to help you recover from the stresses of Christmas cooking. Colourful and packed with flavour, this is spicier than traditional paella.